The U.S. government should be cautious about adopting the state of Wyoming’s strategy for protecting the greater sage grouse—a grassland bird at the center of a national controversy—conservationists argue in a report scheduled to be released tomorrow. The critics say the state, which is home to an estimated one-third of the country’s remaining sage grouse, is pursuing a strategy that fails to preclude intrusive development in key habitat, provide adequate buffer zones, and preserve winter habitat. The critique comes as federal officials have begun to adopt portions of Wyoming’s approach to protecting the bird on federal lands, saying it offers a promising way to balance conservation and economic development. The grouse (Centrocercus urophasianus) makes its home in sagebrush steppe in 11 states and is the largest grouse in North America. Biologists estimate its current population is between 200,000 and 400,000 birds. That could be as low as 1% of historic levels, says Mark Salvo of Defenders of Wildlife in Washington, D.C., a lead author of the white paper. In 2003, the population decline prompted many scientists and environmentalists to ask the U.S. Fish and Wildlife Service (FWS) to add the sage grouse to its list of animals protected by the Endangered Species Act. In 2010, the agency ruled that the bird warranted listing, but that other animals were of higher priority, and said it would reconsider the issue in September 2015. That deadline is looming, and state officials and agencies across the grouse’s habitat have been scrambling to come up with management plans that they hope will prevent the bird being listed as endangered. State officials fear that a listing would force a wide range of development controls on lands owned by the federal government, which account for more than half of the territory of some western states. Nearly one-half of Wyoming, for example, is federal land, including areas key to the mining and oil and gas industries. In a bid to avoid listing, Wyoming’s governor in 2011 outlined the state’s strategy in an executive order. It is based on a concept called core area protection, and recently the federal Bureau of Land Management (BLM) announced it was adopting major elements of the strategy in a long-range plan for protecting more than 800,000 hectares of federal land around Lander, Wyoming. 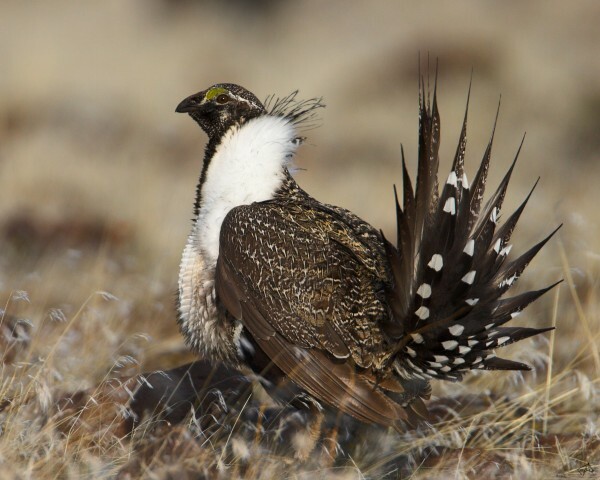 The plan, officially known as a Resource Management Plan (RMP), is the first of 15 such plans BLM is developing across the 11 sage grouse states. Buffer zones aren’t big enough. The plan establishes “surface occupancy buffer zones” around grouse leks—the areas where the birds gather for mating displays—which means no oil or gas infrastructure within about 1 kilometer of active leks. But that number is not supported by any scientific literature or studies, the report argues. Instead, Salvo notes, the best available scientific literature recommends about a 6-kilometer buffer. Critics note that a BLM draft of an alternative plan that was not adopted quoted a 2007 study which concluded that buffers of about 1 to 3 kilometers wide failed to prevent population declines of sage grouse. The agency should heed such research and widen the buffer zones, the report argues. Too few controls on surface disturbances in critical sage grouse habitat. Such disturbances can include roads, oil and gas development, and construction. Wyoming’s plan allows for up to 5% of “suitable sage grouse habitat” to be disturbed, although a 2011 review prepared for BLM by nearly two dozen federal and state biologists and land managers recommended 3% or less surface disturbance. The Wyoming plan allows “too much drilling … in the wrong places,” Salvo argues. It ignores threats to wintering grounds. The plan restricts development activities in sage grouse habitat that the birds use during the winter months, but eases up when the birds move elsewhere in the spring and summer. Research, however, suggests the birds will avoid returning to wintering grounds if they have been disturbed, critics say. They urge BLM to follow the advice of its 2011 review panel, which recommended prohibiting surface disturbance in or adjacent to winter habitat any time of the year. The authors of the report hope BLM officials will take such issues into account as the agency finalizes its remaining management plans, including three more for Wyoming. The state “is key to sage-grouse conservation,” Salvo says. BLM’s Vander Voet says the goal for his office, in administering the RMP, will be to balance the “primary drivers of the local economy” (oil and gas, tourism, recreation, and agriculture) while protecting important cultural and natural resources—including greater sage grouse—for the future. *Correction, 11 July, 1:25 p.m.: The current sage grouse population compared with historic levels has been corrected. Additionally, FWS ruled in 2010, not in 2011, that the sage grouse warranted listing. Finally, a link to the report has been added. This entry was posted in Uncategorized and tagged BLM, federal land, fracking, sage grouse, wild horses by Protect Mustangs. Bookmark the permalink.